We help marketing services firms to integrate professional voiceover services into a variety of marketing delivery vehicles, such as web, video, and phone. Our goal is to make your visually oriented customer deliverables more impactful and memorable. We have found over that years that marketing and multi-media firms vary dramatically with respect to their voiceover needs. When such a firm is involved in project in which voiceover is incorporated, more attention tends to be paid to brand and customer profiling than projects in which we engage the client directly. What Makes Marketing Messages’ Approach Unique? Your client’s brand is central to our partner approach. Employing a framework we call Voice Marketing, we start with a discovery process that focuses on the image and messaging associated with that brand, as well as the customer persona that the end client is striving to appeal to. We then guide our partners in selecting the appropriate Voice Artist(s) and ensure that recordings are delivered with brand and customer persona considerations in mind. What Makes Marketing Messages An Ideal Partner? We are the only nationwide, full service voiceover providers with a Partner Program specifically for marketing and multi-media firms. Our specialty is expanding the reach of your messaging beyond the English-speaking market and into Europe, the Middle East, Africa, and the Asia Pacific region. Unlike voice prompts for IVR systems that join together short phrases into a functional conversation, multi-media applications often employ “long form narration” that requires a unique set of interpretive and technical capabilities. Web pages with short mp3 clips of voice demos for all of our Voice Artists, organized by application and language. Some of our partners link to these pages from their own websites. Click here to listen! Custom demonstrations that simulate how our Voice Artists would sound within a given application. Based on customer-specific scripts and tailored for specific sales situations using one or more of our Voice Artists. Click here to request script examples. Standard wording that describes our Web and Multi-Media voiceover capabilities and are designed to fit into our partners’ proposals. Some insert this text as is, others shorten and/or tailor to suit their needs. If desired, we can tailor a Proposal Insert for you. Click here to request Proposal Inserts. Ready-made e-mail templates to quickly send basic information to your prospects and clients with a few clicks and key strokes. These templates are voiced from the partner’s perspective and include information step-by-step instruction to get started. Click here to request E-mail Templates. 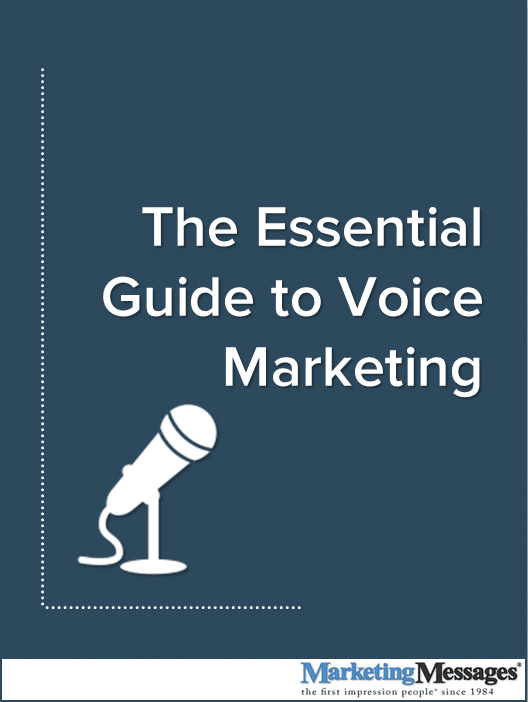 A guide that lays out the step-by-step process by which a prospect generates raw promotional or informational content from which Marketing Messages will build Messages-On-Hold recordings. Click here to request your Creating Your Messages-On-Hold Guide. PDF-based documents that describe best-in-class uses of voiceover services in specific industries. E-Books currently available for Financial Services and Energy. Click Here to request an Industry E-Book. Each partner is eligible to have its logo and company description posted on our corporate website provided that the partner also includes a Marketing Messages logo and description on its own site. We can send you printed or electronic versions of our Company Backgrounder, product brochures, industry e-books, and whitepapers. Please visit our Resource Center to view descriptions of available items and to make requests. Learn more about becoming a Voice Partner! 1-800-4VOICES (1-800-486-4237) for More Partner Information.